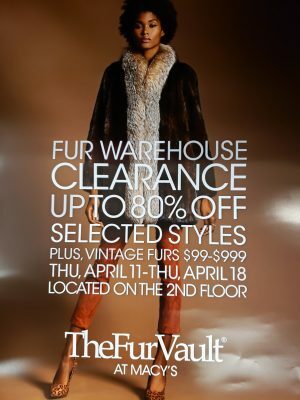 Join Macy’s on Thursday, April 18th for their Fur Redesign sale from 10am until 7pm! Save 20% OFF on fur redesign styles! Get the most value out of your older, outdated fur by getting it redesigned by our specialists for a fresh fashion update. They can completely change the look: a fur coat can turn into a jacket or vest or even fur trim on a cape. Their designers can up or down size, change the collar and cuffs – even the length. Do you have a great cashmere, leather or jean jacket in your closet? They can add fur to any of those as well.